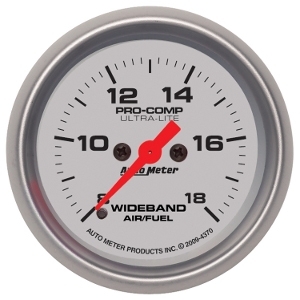 These Ultra-Lite analog gauges from Auto Meter are one of the hottest instruments in motorsports. Their aluminum construction greatly reduces their weight, while their satin anodized aluminum faces and black accents make them easy to read. These quality-engineered mechanisms offer proven durability and unbeatable style. Data Logger 0-5v output provides ECU and data systems with vital info & eliminates redundant sensors.